It doesn’t matter who you are, or how nice it is that you are giving over half of your work away for free. If you are not producing good work, you will not be successful in the world of service-oriented business. Because this model calls for a high quantity of work coming in and out of your theoretical office, assuring a high level of quality can be difficult. In this section of our Frequently Asked Questions, I will teach you how to keep a balanced schedule that allows you to create the best work possible while still maintaining the quantity that you need to survive, how to recognize when and why you should say “no,” and how to avoid an outsourcing disaster. I1: How can we balance the demands of business development while still doing pro-bono work? At verynice, we have a whiteboard up on our wall that, at all times, displays our current pro-bono to paid client ratios visible for all to see. What this does for us is keep a visual and constant reminder that we should or should not be even thinking about taking on new pro-bono projects, or vice versa. Having this ratio in front of you at all times will help you avoid many potential speed bumps that result from an irresponsible balance of pro-bono and paid work. I2: How do I draw the line between paid and unpaid offerings? The clients you choose to offer your pro-bono offerings to versus your paid offerings is heavily reliant upon the policies that you chose to set around your offer. While verynice elects to offer our pro-bono services to any organization so long as they are a 501c3 organization, you can choose to get even more specific in your offering. Just as who you offer your pro-bono services to be flexible, the specific service(s) that you choose to make available pro-bono are also up to you. Just because you offer web design services to your paid clientele does not mean you absolutely have to offer those exact same services to your unpaid clientele. That is the clear deviation that this model promises from the one-for-one model. The needs of each of your clients are very different. There are no two clients in the world that have the exact same expectations, so your offering doesn’t have to be the same, either. In order to draw the line between your paid and unpaid offerings, simply set policies for yourself and stick to them. It might sound harsh, but the best way to stick to your guns in regards to what you can and cannot offer to your pro-bono clientele is to simply never deviate from the rules you set for yourself. It is not about saying “no,” necessarily, but instead it is about saying “yes” to the right things. I3: How and when do I say no? Depending on the infrastructure you set up for yourself, you may, out of courtesy, be forced to physically say “no” to each and every one of your potential pro-bono leads. That can be very awkward and emotionally draining. Instead, we recommend actually having a line of text on your pro-bono application page or an email auto-responder that simply states: “Thanks so much for your interest in our pro-bono services! We can’t wait to review your project. Unfortunately due to the high-volume of requests we receive, we are not able to respond to each individual application. Have a great day”… or something along those lines. I4: How do I manage a volunteer? Especially when they are not paid? 1. Clearly explain the scope of work. By being very up-front about the time commitment and project scope, you are not keeping any information that may cause a volunteer to find themselves unable to proceed with a project. Then simply ask them: “Can you commit to this project?” The volunteer needs to understand that they are not the only person on the planet that can assume the position they are being considered for. If they show any sense of concern towards the scope of the project you are about to bring them on board for, do not proceed with the relationship. 2. Find specific skill sets and interests. The more detailed you are, and the better you become at understanding the specific passions of your individual volunteers, the quicker you can create a working relationship that is beneficial for both parties. Take the time to learn the interests of your volunteers, and give them opportunities that match those interests perfectly. 3. Set a schedule. Very often in pro-bono projects, your client will not set a time-frame. Just because there is no client-facing time-frame does not mean that you should not have a time-frame for yourself and your team. Always have a schedule, and always be very clear about milestones for a project. I5: How do I ensure that I don’t have an outsourcing disaster? The moment you start outsourcing your work to others a lot can go wrong. When you are no longer the sole creator of a project, you can lose track of progress or creative control over the final output very quickly. While these risks are very real, there are plenty of precautionary tactics that can be leveraged in order to reduce the amount of mishaps from point A to point B. 1. Always have a back-up plan. Never put all of your eggs in one basket when it comes to trusting a contractor or volunteer. For every contractor I bring on, I have a back-up plan in mind. Always keep a list of other go-to people that you know would be ready to help finish up a project if one of your freelancers or volunteer bails on you. Trust me, it will happen— hopefully not often, but definitely at least a handful of times in your career. 2. Have an agreement. An agreement will help you reveal every aspect of your project to each team-member up-front. Be very transparent regarding time-frames, accountability, and change-orders. Set the expectation for time commitment on a project higher than it actually is. While it sounds simple, just being as up-front as possible can really help you avoid a disaster. 3. Clarify communication trails. Always communicate directly with your contractor versus adding them to an email-chain. Things can get messy fast when you have a contractor as part of the conversation with your client. While it might save you time, the moment you start cc’ing your contractor or volunteer on an email with your client, you run the risk of having yourself accidentally knocked off the “reply to” list. As a result, your project will spiral out of control very quickly as your contractor may accidentally promise something on your behalf. I6: How do I build an online community supporting the pro-bono movement? Building a community of people to collaborate with or serve as ambassadors of your brand will take time. While verynice, as an initiative, was launched in 2008, we only started publicly promoting the studio as a business in the middle of 2009. The moment we entered the public eye, after about a year or so of building a portfolio, we hit the ground running fast. If you want to build a community to support your efforts by serving as volunteers or referrals, you just need to go all in on your mission. Let everyone know about your pro-bono mission. The moment you put that commitment out there, it will attract the right people. I have found that soliciting volunteers is never a good idea as it often will result in commitments made under pressure. Instead, just keep your door open, do good work, explain your mission clearly, and the right people will arrive at your doorstep. Sure, this takes time, but community support is about quality, not quantity. I7: How can I reduce my overhead? In the world of service-oriented business, there are two types of overhead: fixed overhead and overhead that accrues from a given engagement or account. The more important of the two types of overhead to really keep track of to ensure that you are reducing everywhere that you can, is your fixed overhead. This is overhead that, no matter what, each month you write a check for. Things like employee salaries, rent, health insurance, printing, gas, parking, etc. While the specific industry you are in dramatically affects the amount of overhead you will face, there are a few tips and tricks I have learned to reduce both personal and business expenses. Buy what you need, borrow the rest of it. Only hire people that are absolutely essential for your day-to-day operation and outsource the rest of the work to contractors. Budget projects appropriately to ensure you never go out of pocket for anything. Consider public transportation or carpooling instead of day-to-day reliance on your own personal vehicle to get around. Use free Google products (drive, calendar, mail) as often as you can so that you can reduce the monthly fees of other hot products on the market. I8: How do I know if I’m doing good pro-bono work, or if I should be doing things differently? The best way to measure the quality of your pro-bono work is to directly compare the work to your paid engagements. Ask yourself: “is the quality of my paid work at a higher level than the quality of my unpaid work?” If the answer is “yes”, re-evaluate your time management systems in order to allow for an equal focus of energy on both your pro-bono and paid projects. It is not fair to keep your non-profit clients waiting, or to deliver inferrior output! Stay critical of yourself and always ask: “Am I happy with this work? Would I pay for this work?” Only then will you achieve a balance of quality. I9: What if I’m not good at sales? A substantial piece to the puzzle of starting a business with strong infrastructure for quality assurance is the entrepreneur’s ability to sell their value. Whether it is a product or a service oriented business, this is always the case. If you are uncomfortable with sales, know that it does get better. Sales, as a discipline, are very awkward for many, especially service-providers, because it requires a substantial amount of confidence in the value of your time or offering. This said, there are two directions you can take your business even if you yourself are bad at sales. Find a strategic partner. If you are not good at sales and you have no interest in learning the discipline, or simply don’t have the bandwidth to learn yet another skill to get your business up-and-running, find a partner! There are people out there that excel at sales. Align yourself with one of those people and knock it out of the park. Be patient and figure it out. If you are not in the business of looking for a strategic partner, just be patient and figure it out. Most entrepreneurs did not start out amazing at sales, and gradually got good at it through experience. Sales is not something that can be learned by reading blogs or going to business school. Instead it is learned through experience— successfully winning a bid, and more importantly, through losing bids. Get out there and try it! What do you have to lose? I10: How do I measure the social impact of pro-bono design? 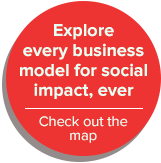 As a service provider, you are not in the business of creating social impact yourself, alone. Instead, the social impact of pro-bono service is actually created through a second degree of separation: our clients. verynice, for example, does not create social impact, but our clients and partners do. Our role in the facilitation of social impact is through the design of a model that alleviates expenses which, as a result, can be re-invested into the organization. In order to measure the impact of our organization, we compare the scopes of our pro-bono projects to the rates of our paid work and define a figure per each volunteer project that represents the estimated value/financial equivalent in order to measure the dollar amount that the organization can then, in turn, re-invest into their organization. We frequently revisit the equivalent rates for our previous projects to keep our gross donation measurement up to date with our most recent set of rates. Aside from financial measurement, we also catalog approximate hours that have been contributed to each project. To date we have created a measurable equivalent of over $1,500,000 in pro-bono services donated and re-invested into non-profit impacts, along with over 50,000 total volunteer hours as a studio. I11: How can I give my pro-bono projects that same amount of attention as my paid projects? I can answer this question in one word: delegation. The key to this business model’s success is creative outsourcing and collaboration through delegation. One person cannot possibly generate the amount of bandwidth this model requires on their own– you need help. If you are not prepared to enter more of a management/director role, this model is simply not for you.